The ICC is set to hold its annual conference week in Singapore, which will commence on Sunday with a meeting of the Chief Executives Committee (CEC) and conclude with the inauguration of Sharad Pawar as the seventh ICC president. Pawar will succeed David Morgan who finishes his two-year term next week. The ICC executive board is also set to discuss the nomination of John Howard for the role of vice-president, which has been marred by controversy with a number of boards opposing his candidature. Since his days as Australia's prime minister, Howard has endured a torrid relationship with Zimbabwe cricket, often being a vocal critic of Robert Mugabe's regime. South Africa and Zimbabwe initially expressed their opposition to Howard's nomination, and they were later joined by Sri Lanka, leaving him vulnerable to being disqualified. Howard recently met with ZC chairman Peter Chingoka and managing director Ozias Bvute in a "friendly, constructive and frank" exchange of ideas, following which there are indications that Zimbabwe may change their stand on the issue. "A section of the international media has erroneously created the impression that we have been at the forefront of a motion to block Mr Howard's nomination. This is not only maliciously incorrect but also ignores the fact that our structures dictate that such a decision can only be taken by the ZC Board which is in fact still to meet and state a position on the matter," Bvute said. Bvute also indicated that past tensions are unlikely to influence Zimbabwe's final decision. "We are not vindictive people regardless of how badly we have been portrayed and treated in the past. Our concern has and always will be the welfare of the game. Our final decision and vote will be guided by what is in the best interest of cricket in this country." Chingoka however, was non-commital on the issue. "I don't have much to say, we had a friendly discussion, it was very constructive, we were very honest and frank with each other. The matter will be discussed by the ICC, so I don't think it's appropriate for me to say any more," he was quoted in the Sydney Morning Herald. Another pressing issue that will be addressed at the CEC meeting is to do with the Future Tours Programme (FTP) for the period of 2012-20, in particular the introduction of greater context and content for international cricket. The subject has already been under consideration by a working group consisting David Collier (England and Wales), Nishantha Ranatunga (Sri Lanka), N Srinivasan (India), James Sutherland (Australia) and Dave Richardson (ICC general manager - cricket). An ICC event covering both the Test and ODI formats is likely to be discussed. The ICC executive board will also receive a recommendation from the CEC on the implementation of the decision review system across the board in Test cricket, as well as in the 2011 World Cup. Additionally, the CEC will consider and recommend to the board the eligibility rules and the stand-out period for moving from Associate to Full Member status. The executive board will receive updates on the formulation of the ICC strategy for the period 2011-2015, and the design of mandatory safety and security regulations drawn up by Security Task Force, chaired by Lord Paul Condon, set-up following the Lahore attack last year. 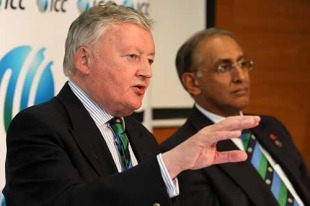 The board will also consider Seychelles' application for Affiliate Membership of ICC. If successful, Seychelles will become the 105th Member of the ICC. Meanwhile, the ICC Associate and Affiliate Members will nominate their ICC executive board director representatives, who serve a two-year term, at their meeting on 28 June 2010.